“Filmain shilmain chaltee theen, hum ganay shanay gaatay thay, woh raatain ab kahan gayeen, jab pal bhar main so jatay thay …” These lines of a song by Shahvaar Ali Khan epitomise the childhood parents today reminisce about. This was when iPads hadn’t replaced BMX cycles, going to the circus was a matter of celebration, not concern, maachis bombs were the only explosives kids knew about, and when Captain Planet and Ainak Wala Jin, and not Chota Bheem, were post-homework TV options. Sharmeen Obaid Chinoy’s 3 Bahadur is an effort to give the children of today a chance to think and dream about local heroes, so that even they have something to reminisce about when they grow up. 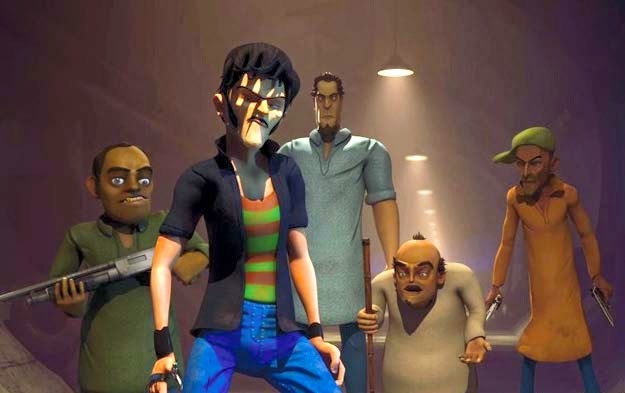 Although an animated film is no solution to the bigger socio-political problems we are laden with, it is still a development that children will probably remember… other than the black day when Zayn Malik left One Direction. 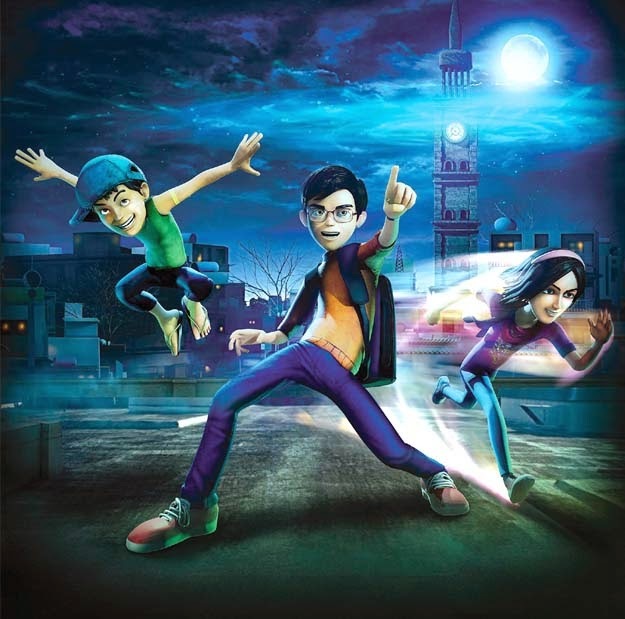 3 Bahadur is a step in the right direction and on the right screen; it exceeds our expectations for Pakistan’s first animated feature film, but doesn’t give us anything iconic. The movie is based in Roshan Basti, a make-believe place where you’ll see Rio and Gluco biscuits and Commander Safeguard plastered on every other wall and billboard. The film starts to seem like a biscuit advertisement in places, especially when one of the three children with super powers sports a Rio cap, but that’s also when some genuinely funny moments save the day. The point where the fattest goon (Pateela) performs a mix of kathak and Bharatnatyam in his free time is humorously depicted. Kudos to Bassam Shazli for smoothly fusing terror and stupidity in Pateela’s character through his voice. Everything seems to be going fine in Roshan Basti until Mangu (Ally Khan) meets Baba Balaam (Nadir Siddiqui), who disappears after giving Mangu the key to evil powers. 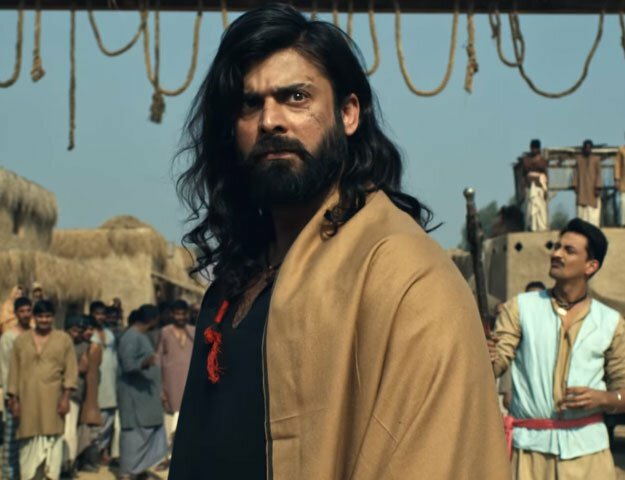 Mangu starts using those powers against the innocent dwellers of the town till Kamil (Hanzala Shahid), Zuhab Khan (Saadi) and Muneeba Hasan sneak into the tower where he lives. There, they are gifted with special powers by a flying object (not clearly identified in the film), and those powers help them make their way through the tower. Thus begins a war of good-versus-evil, adults-versus-children, and the old-order-versus-new-order, with uncle Imran, the fairest of all characters, being the only voice of reason in the basti. Ha, that’s one way of politically enlightening children. Although the film is well-paced and Shiraz Uppal’s music gives you a delightful entry and memorable exit from the cinema, it is the screenwriting and pacing in general that bite 3 Bahadur in the back. The first major fight sequence in the film is so dramatic and action-packed that it kills your appetite for another one and the culmination of events adds nothing new to the plot. It seems like a repetition of whatever happened in the first half, just with a little more detail and less drama. The reason why the film fails to give us anything iconic lays in the superficial and ordinary characters of the protagonists. Although all three characters, Kamil, Amna and Saadi, have clear motivation for what they do, they lack the detail and oomph that’d make them superheroes, those that a child would look up to. On the other hand, the villains are vicious ad more dedicated; this is not only because of them being older than the protagonists and better voice acting, especially Khalid Ahmad’s, but also because they have been written and conceived more comprehensively. Despite being a surface-level attempt at the art of animation, 3 Bahadur’s post-production team deserves credit for creating a guinea pig that is going to test the courage of other animation houses in Pakistan. Verdict: 3 Bahadur has funny and frightening moments for children. The use of Urdu language may be the only saviour if they enter expecting something similar to Madagascar or Rio.